Fans will be outraged by this... what is he trying to say?! For the past week, there has been a mystery hovering over Montreal Canadiens goalie Carey Price's injury, which prevented him from accompanying his team on the last trip to Florida, Tampa Bay and Dallas, forcing backup Antti Niemi to face off against the Panthers, Lightning and the Stars. 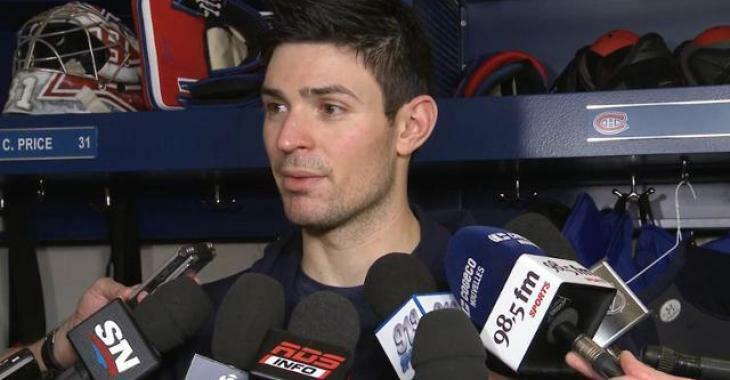 Finally, the mystery came to an end on Wednesday when Price was back on the ice with the rest of his teammates and faced media members as they kept asking about the mysterious lower-body injury. Latest gossip was on the back of many journalists' minds when Olivier Primeau, owner of Beachclub and host of the reality show XOXO in Montreal, reported yesterday that "Price's injury was quite serious and was affecting his knee once again." Primeau reported that Price had received injections in his injured knee and may not even be able to return to play for the rest of the season. The star goalie revealed that the injury had been playing with discomfort for ‘about seven weeks’ and the injury flared up last Thursday. Price even added a comment that is doomed to make fans react in Montreal, stating that the injury’s flareup and his child’s impending birth as the “perfect storm” to stand down for the last three games. The break was not planned, as per John Lu. Price added that he could have played through his lower-body injury if it had been playoffs. Angela Price gave birth to the second child in the family, a baby girl named Millie during his absence from the club. Some believed it was not a coincidence that the netminder left the team at the same time as his daughter's birth, even though the players' collective agreement has a clear clause that allows any player to head for the bedside of his spouse about to give birth and without penalizing his team. Price could return as soon as Thursday night. The star netminder added that he will see how he feels tomorrow morning whether he will play against the Vancouver Canucks. Fans have always been quite hard on the star goalie, especially since he signed his blockbuster contract last summer. There is a lot of pressure on Price's shoulders and we are pretty sure fans will be outraged to hear that he could have played through the injury but decided to stay at home, with his wife and new baby girl, while his team battled on the road.